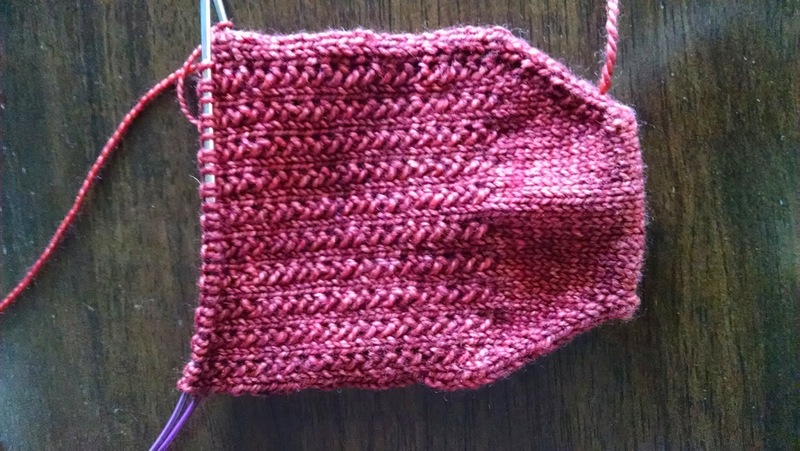 Throughout the excitement of the baby news over the holiday, one thorn continued to poke me in my side - toe-up sock knitting. Frankly, I was ready to give up after a second pattern I tried ended up again looking incredibly wide. While I was frogging this latest attempt, I was pondering how I might get through an actual pair of these and somewhere in the back of my mind, I remembered that one of my favorite designers, Sarah Ronchetti, released a toe-up version of her Scott Base Socks. I made a pair of these cuff down already and absolutely love them so 1) I wouldn't mind another pair, and 2) I thought if anyone could guide me through a pair of toe-up socks, it would be Sarah. Her patterns are incredibly well-written. I immediately downloaded the toe-up version and went to work. These socks are awesome no matter which direction you knit them. Not only am I well into the foot of the socks but they actually look normal-sized (for me). I am knitting the adult small. I've read ahead to the instructions for the heel and they are concise and easily understood. I think I just might make it through this pair! Woo hoo! Thanks, Sarah! My week off of work is coming to an end, although I only have to work 3 days this week. We will likely stay at home and watch movies for New Year's Eve again this year, which is absolutely okay with me. Maybe I'll make some tasty snacks. We usually eat junk food but my ever expanding waistline is telling me I may want to make another choice this year - at least to avoid the pre-packaged stuff, if not all the calories. I've discovered a food blog that I am really enjoying called South Your Mouth. It's written by Mandy Rivers and not only does she have a wonderful sense of humor, but we tried out a few of her recipes for our Christmas dinner this year and loved them. I hate cooking, so that is really a ringing endorsement. I encourage you to check her blog out! PS - Any recommendations on the best graphic editing tool for making a banner for this blog? I spent over an hour fooling around with trying to do a new banner. I haven't liked the current one since I put it up. Recommendations more than welcome! The sock is looking good! I love the Scott Base pattern! It's a really great everyday sock. I'm glad that toe-up is working out for you now. I knit my socks from both directions, but I do think toe-up is my preferred method.